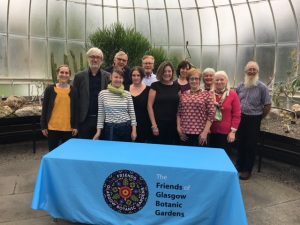 On Saturday, the students who completed the 2018 Spring course of the Certificate of Practical Horticulture were awarded their certificates in the South Wing of the Kibble Palace. A special award was also made by the Baldernock Gardening Club to the ‘most improved’ student. The recipient was Karen, a student who traveled down every day from Aberdeen to attend the course and is determined to pursue a career in horticulture. Well done to everyone, and thanks to lead tutor Paul (far right) and assistant tutor Lisa (far left) for making the course as successful and friendly as usual. « Holy Smoke Robin!! It’s the Bat and Moth Night! !